Fire in Notre-Dame-de-Paris: why is fire so difficult to control? 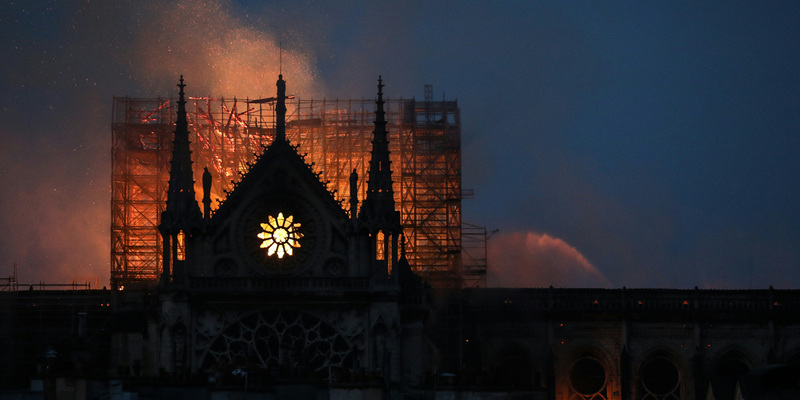 A violent fire devastated Monday night the roof of Notre-Dame Cathedral, whose iconic arrow collapsed. The intervention of Paris firefighters on this type of fire is particularly difficult. The images are all the more striking as they refer to a feeling of inevitability: that of the flames that devour Notre-Dame Cathedral in Paris, where a violent fire broke out shortly after 18:30 Monday. The iconic arrow of the building, eight centuries old, has collapsed, just like the central bell tower. The frame, it, literally goes to ashes, despite the efforts of some 400 firefighters mobilized. "It's a very complex fire," explains Europe 1 Laurent Vibert, former commander of the Paris Fire Brigade rescue operations. "We can see it is a roof fire that probably took the level of scaffolding," he says at the microphone of Matthew Belliard, although the origin of the fire has not yet been clearly established. "The fires are very special and devastating, they take a very strong intensity, very quickly," says the former spokesman of the Paris Fire Department. "You have to go around the fire, be careful of the wind too." The collapse of the arrow has also provoked a call for air, thus stoking already devastating flames. The intervention is also made more complex by the height of the monument, which rises to 69 meters at the level of towers, 93 meters at the top of the spire. "In this case, the device put in place must allow to accompany the control of the fire by means of elevators, large scales, nacelles on which it is necessary to put hydraulic means to be able to contain the fire", underlines again Laurent Vibert. But the scales are only 30 meters long, when articulated lift arms reach 45 meters. US President Donald Trump quickly recommended Canadair's intervention to overcome the fire. But this is actually a false good idea. These planes are "technically unsuitable for extinguishing this type of fire," explained the Civil Security on Twitter. "Helicopter or airplane, the weight of the water and the intensity of the dropping at low altitude could indeed weaken the structure of Notre-Dame and cause collateral damage on the buildings in the neighborhoods", specifies this service of the ministry of the interior. # NotreDame # Paris Full support for the firefighters @PompiersParis during the intervention on the dramatic fire of Notre-Dame. All means are committed with the exception of Canadair aircraft technically unsuitable for extinguishing this type of fire. # NotreDame @ PompiersParis Helicopter or airplane, the weight of the water and the intensity of the drop at low altitude could indeed weaken the structure of Notre-Dame and cause collateral damage to the surrounding buildings. The air assets are indeed reserved for high points or chalets very isolated in mountain for example. And firefighters know what they are doing. Because Notre-Dame de Paris is part of a particular plan of intervention. "This is an establishment listed as they say.There is an analysis done upstream with the buildings of France and the museums of France," says Lawrence Vibert Europe 1. According to this specialist, the intervention should last "several days, at least in terms of surveillance". Firefighters must ensure that there is no fire recovery. "We must first circumscribe the fire and then, progressively, make recognitions of all the parties that could have been burned, the woods that would have been blackened, make rounds with thermal cameras to see if the fire is is not propagated inside the so-called soul of the wood.These are very technical fires ", summarizes Lawrence Vibert. The Paris prosecutor's office has already announced the opening of an investigation into the causes of the incident. In 1972, the cathedral of Nantes had also been the prey of the flames, caused by a worker-roofer making repairs on the roof of the monument. According to the report of the time, the warning was given at 4:18 pm, the fire extinguished at 9:30 pm, but the operation was completed the next day at 10:38.